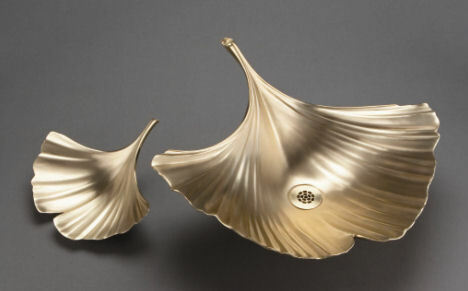 Ginkgo vessel sink and bowl designed by Wawirka, inspiration by nature! * Added Ginkgo fossil photos: Lower Upper Permian (Germany) and Oligocene (B.C. Canada). Also on Spanish page. * Added text and photos of Ginkgo petrified wood. Also on Spanish page. 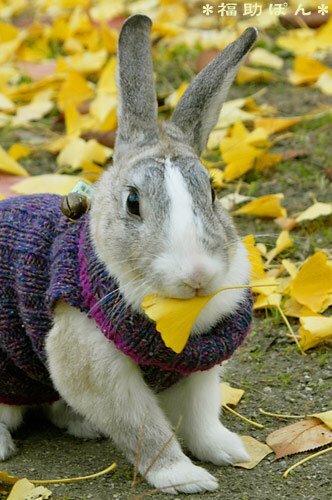 This lovely photo of a rabbit with Ginkgo leaves is made in Osaka, Japan. You can see more photos of the Ginkgo rabbit here. YouTube is a consumer media company for people to watch and share original videos worldwide through a Web experience. Everyone can watch videos on YouTube—both on YouTube.com and across the Internet. Type in "Ginkgo" in the search box and you'll find for instance videos by Davy Levkovich, Kyoto University. 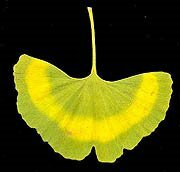 Can I grow Ginkgo tree in Northern California, Laytonville area Zone 14 at about 2000 ft elevation ? * On this page (readers for readers) added photos of a school project in Argentina. This Ginkgo leaf that I spotted in Amsterdam has a special fall coloring, enjoy! * New photo photospecial page: old Ginkgo, Humboldt University, Berlin. The first two planes hijacked on Sept. 11, 2001 took off from Logan International Airport, setting in motion a chain of events that changed the world. Massport officials unveiled plans for a $3.5 million memorial that will commemorate Logan as the "Point of Departure." Visitors entering the two-acre memorial will find two separate walkways diverging from the same spot, symbolizing that American Flight 11 and United Flight 175 both took off from Logan that morning. 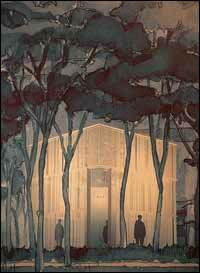 As the planes took different routes to the World Trade Center, the walkways each will offer a different path, winding through a grove of Ginkgo trees. * Added Ginkgo fossil photo: Paleocene (Spitsbergen, Norway). Also on Spanish page. * Added photo of Ginkgo in Monaco. * Added photo of Meissen porcelain plate with Ginkgo design on Art-page. 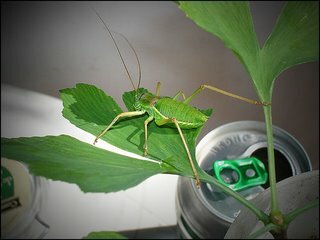 Special photo of Ginkgo leaves with grasshopper and Heineken beer. This photo can be seen and downloaded in various sizes at Flickr.com, photo by Haupthase.